Once home, Newton regretting leaving. He told himself he’d go inside tomorrow. So the next day he pushed down his fear and returned to CrossFit Logan Martin. This time he turned off the car, got out, and opened the door. 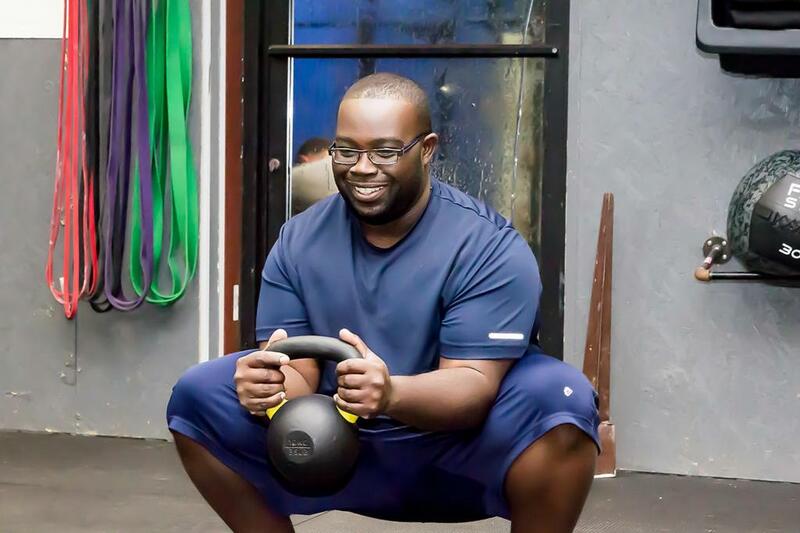 The decision to overcome his fear and walk through the door opened up a world he thought was closed to someone like him, someone overweight, out of shape and desperate to make a change. The decision would change his life. 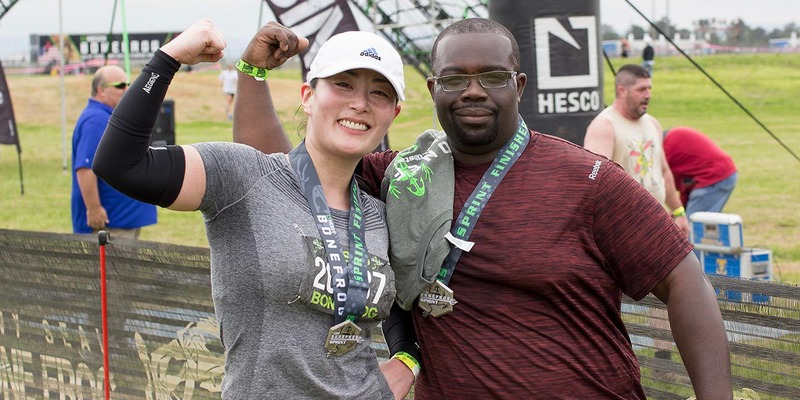 Five months before he walked into CrossFit Logan Martin, 36-year-old Newton, an engineer at Honda, participated in a health screening at work and discovered he weighed 318 lb. Newton knew he was overweight, but he avoided the scale and tried not to appear in photos. He had no idea he’d passed 300 lb. He might not have known how much he weighed, but he knew how he got there. He’d been in a rut for years. Every day he’d go to work at Honda, sit at a desk for eight hours then go home, exhausted. His diet consisted of takeout: fried chicken and mashed potatoes and gravy, or a burger from McDonald’s or Burger King. He drank about six to eight 12-oz. cans of soda every day. Newton had recently lost a grandfather and both grandmothers to cancer. Diabetes and heart failure ran in his family. Fortunately, Newton didn’t have diabetes or high blood pressure—though he did suffer from sleep apnea—but he knew his lifestyle was unhealthy. Seeing that number on the scale pushed Newton to make a change. Instead of sitting during his lunch break, Newton began walking in the parking lot for 10 to 15 minutes. He liked the feeling of moving around, so after a few weeks he started walking his beagle, Shorty, for a mile each day after work. “After I started walking more, I noticed the weight started coming off. One mile turned into two miles, then two miles turned into three miles,” Newton said. One Sunday afternoon about five months into his walking routine, Newton set off for a walk. It felt good, so he kept going. Once he got home, Newton was surprised to find out he’d covered 13 miles. Newton also changed his diet. Two months after the health screening he stopped drinking soda. He began making meals at home, searching YouTube for healthy recipes. Instead of a burger he’d sear a tuna steak, and he baked his food instead of frying it. Soon Newton noticed he had more energy. He used to get winded walking up the flight of stairs to get to his desk, but after a few months of walking regularly he could get there without feeling out of breath. Newton’s sleep apnea also improved—he began sleeping better and waking up refreshed. Five months after the health screening, in September of 2017, a colleague at Honda asked Newton to work out with him at CrossFit Logan Martin. Newton had lost about 30 lb., and he was excited about the positive changes he’d made in his life. However, he wasn’t sure he was ready for something like CrossFit. “I pictured muscle-bound guys doing stuff that I know I couldn’t do. I was afraid of it,” Newton said. He was so intimidated he couldn’t bring himself to get out of his car that first day, when he saw the class run out of the gym carrying medicine balls. But the next day he forced himself to make the long walk from the car to the front door. Scott Campbell, the affiliate owner, greeted Newton when he arrived. After learning about Newton, Campbell shared his own story. 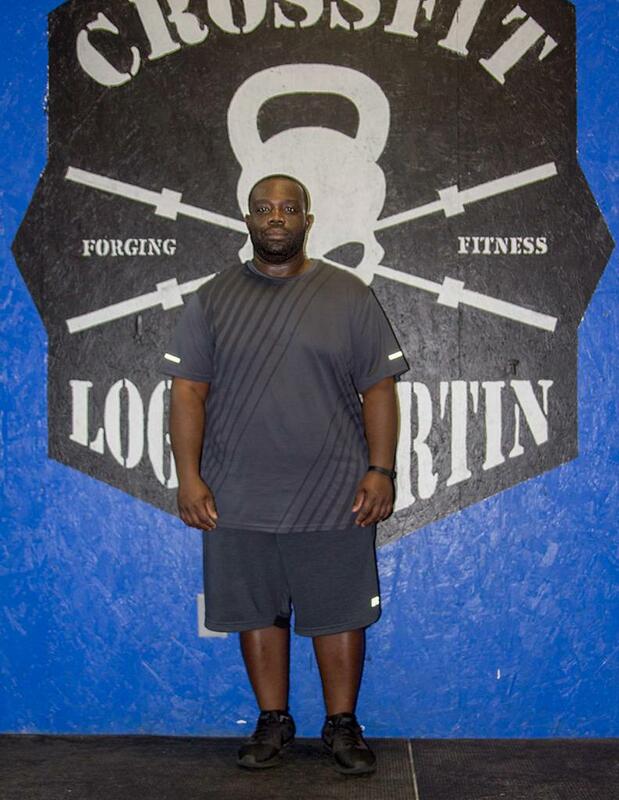 Campbell used to weigh more than 300 lb., 100 of which he lost after starting CrossFit and improving his nutrition. Newton stayed and worked out that day. He did back squats for the first time in his life and found it difficult to sit down or walk up the stairs the next day. In October 2017, Newton participated in a six-week fitness-and-nutrition challenge at the gym. He started following a ketogenic diet, eliminating sugar, limiting his carbohydrate intake, and eating mostly protein and vegetables. 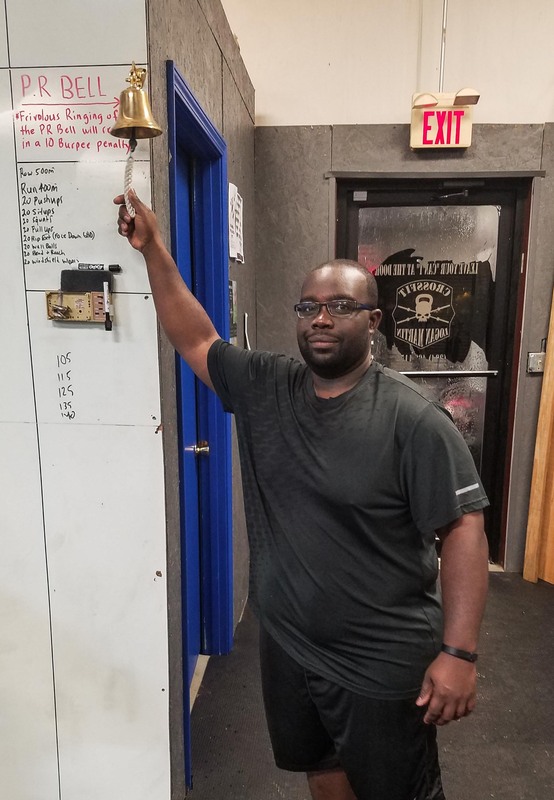 In April 2018, a year after the health screening and seven months into CrossFit, Newton weighed himself and discovered he’d lost 100 lb. through diet and exercise. Now Newton attends CrossFit five or six times a week. When he wakes up in the morning the first thing he does is check the day’s workout. Newton attends the 4:30 p.m. class, something he said he looks forward to all day at work. The man who a year ago was exhausted by eight hours at his desk now has so much energy he sometimes stays at the gym for two or three classes in a row. 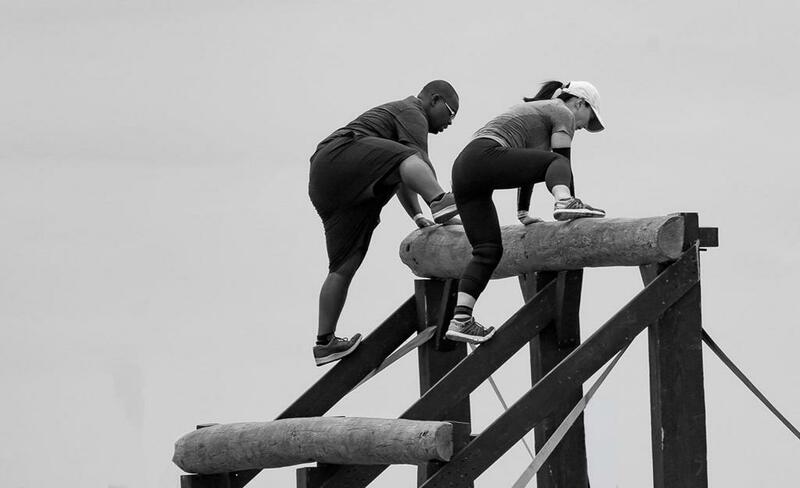 “My first week there I got challenged to a 2,000-kilometer row. I did that in 9 minutes, and since then I’ve improved my (2,000-kilometer) time to 7 minutes,” Newton said. He recently performed his first strict chin-up, something he never thought he’d be able to do, and he’s working his way to doing a handstand. He doesn’t think he’ll ever enjoy the Assault Air Bike. Newton’s goal is to get below 200 lb. and then reassess. 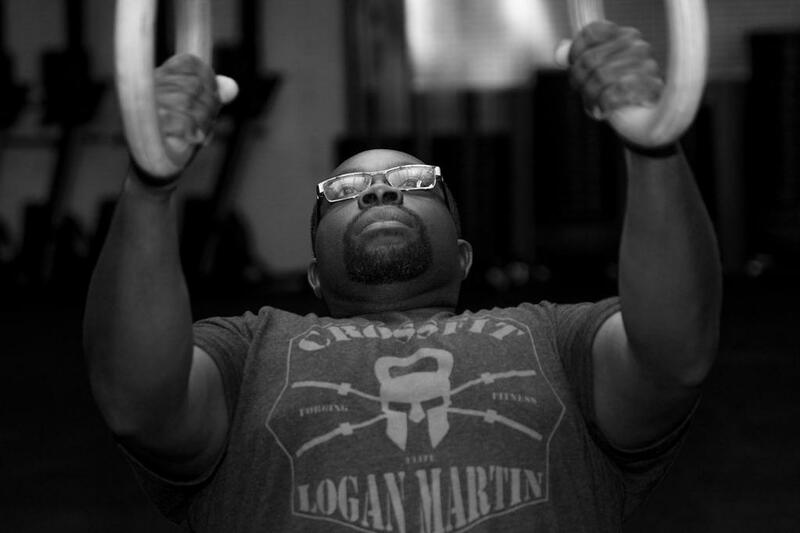 Whatever happens, he’ll keep going to CrossFit Logan Martin, which he says is the secret to his continued success. “To see people with my build doing those types of activities and being successful at it, that gave me the confidence to realize that ‘yes, I can do this as well (as they can) too.’ And the camaraderie that we have there at CrossFit Logan Martin is unlike any other gym that I have ever been to,” Newton said. In order to walk through the door of CrossFit Logan Martin, Newton had to put aside everything he thought about himself and forget what he’d heard about CrossFit. Once inside, he discovered a place of people just like him, people in search of community and better health.